608 pages | 50 B/W Illus. 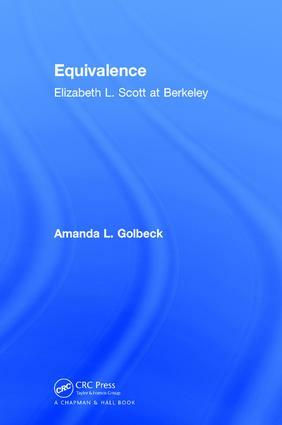 Equivalence: Elizabeth L. Scott at Berkeley is the compelling story of one pioneering statistician’s relentless twenty-year effort to promote the status of women in academe and science. Part biography and part microhistory, the book provides the context and background to understand Scott’s masterfulness at using statistics to help solve societal problems. In addition to being one of the first researchers to work at the interface of astronomy and statistics and an early practitioner of statistics using high-speed computers, Scott worked on an impressively broad range of questions in science, from whether cloud seeding actually works to whether ozone depletion causes skin cancer. Later in her career, Scott became swept up in the academic women’s movement. She used her well-developed scientific research skills together with the advocacy skills she had honed, in such activities as raising funds for Martin Luther King Jr. and keeping Free Speech Movement students out of jail, toward policy making that would improve the condition of the academic workforce for women. The book invites the reader into Scott’s universe, a window of inspiration made possible by the fact that she saved and dated every piece of paper that came across her desk. "What an intriguing life Scott led!" ~ Deborah Bennett, Lawrence Livermore National Laboratory, Ret. Amanda L. Golbeck is professor of biostatistics and associate dean for academic affairs in the Fay W. Boozman College of Public Health at the University of Arkansas for Medical Sciences. She has had a long-term interest in gender equity issues in academe that stems from her early association with Scott. Golbeck was the lead editor of Leadership and Women in Statistics (Chapman & Hall/CRC Press) and has had a number of published articles on gender issues in the statistics profession. In 2016, the Committee on Presidents of Statistical Societies selected Golbeck to receive the COPSS Elizabeth L. Scott Award.